DARTMOUTH – The Framingham State men’s soccer team opened up the 2017 season with a 4-2 win over UMass Dartmouth on Friday afternoon at Cressy Field. The Rams are now 1-0 on the year and the Corsairs fall to 0-1 on the young season. 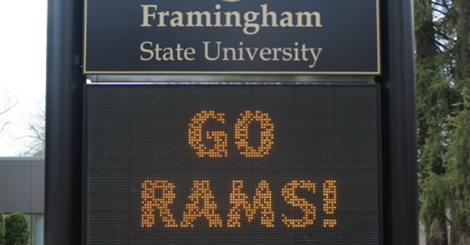 Framingham State opened up the scoring in the 5th minute when junior Justin Hansen found the back of the net for his first score as a Ram. In the 20th minute freshman Isaac De Souza scored his first of two goals on the afternoon off a pass from Ken Stahovish. The Corsairs answered just over a minute later when Elvis Mendes scored an unassisted goal after a Josh Arno save to cut the deficit to 2-1 in favor of the Rams. The two teams traded scores before half; in the 30th minute De Souza scored unassisted for the Rams and just a few moments later Fabio Araujo scored with an assist from Mendes. The Rams scored an insurance goal late in the second half when Vinicius Rosa tallied his first career goal to reach the final score. The Rams outshot the Corsairs 14-to-13 and were awarded 5 corner kicks to the host’s 3. Arno got the win in net for the Rams while Danny Andrade suffered the loss for the Corsairs. The Rams return to action on Sunday, September 2, when they travel to Suffolk University for non-conference action at 1 p.m.